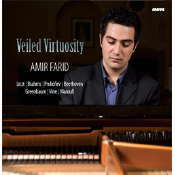 Winner of the 2006 Australian National Piano Award, pianist Amir Farid has been described as "a highly creative musician - a pianist of great intelligence and integrity. He brings strong musical substance to all that he does, imbuing it with his own particular experience and understanding", and who "in a well populated field...distinguishes himself for all the right reasons". This is Amir's Debut CD. Ludwig van Beethoven Sonata in C, Op 53 "Waldstein"
For more information on this CD visit the Move Records website.